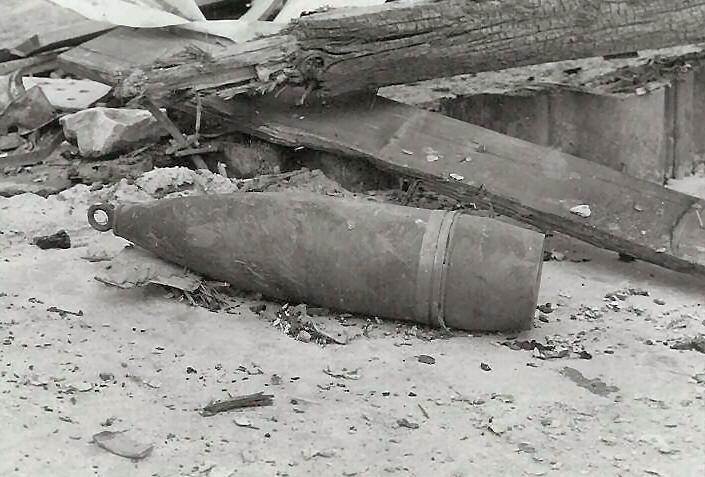 A days empty brass off North Vietnam. 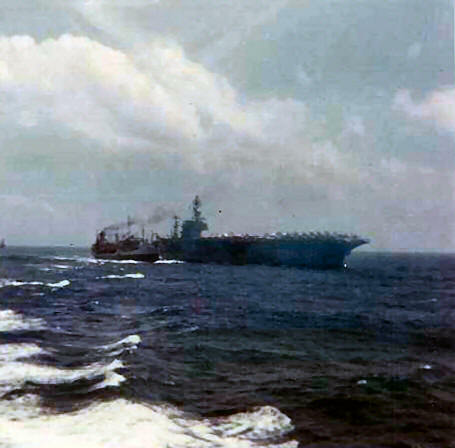 Alongside carrier in 1967 or 1968. 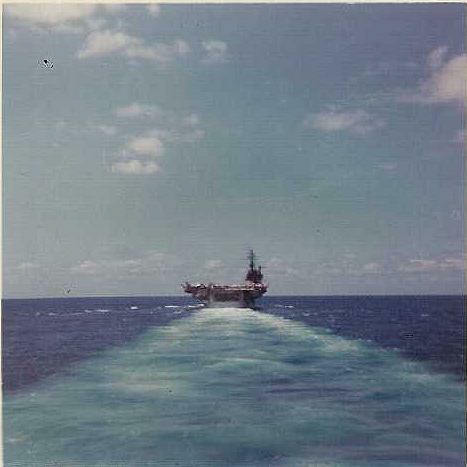 USS COLLETT on plane guard 1967-1968. 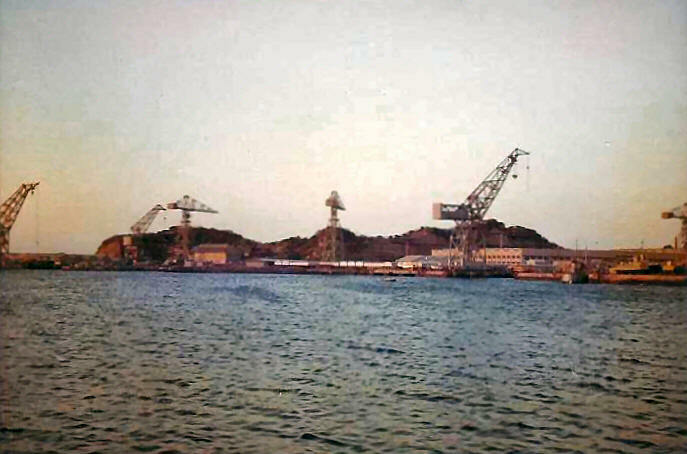 ATF in Yokosuka from Collett, 67-68. Collett alongside Oriskany CVA-34, 67-68. Collett looking aft while running hard, 67-68. Collett pulling away from oiler and carrier, 67-68. 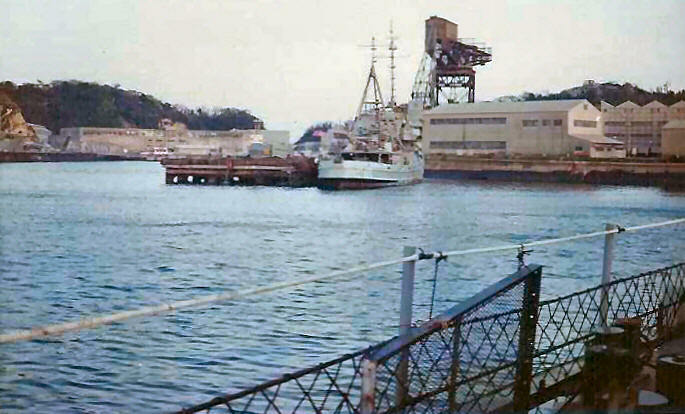 Special Projects sub and a nuke in Yokosuka from Collett, 67-68. Enjoying the breeze as the Collett runs hard, 67-68. 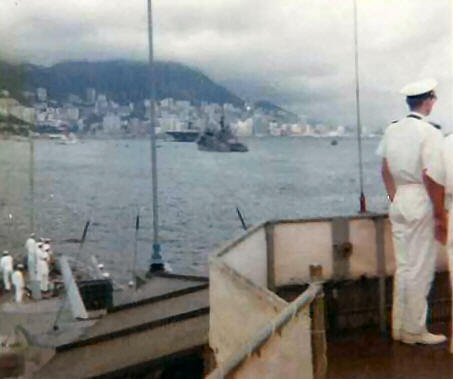 Hong Kong from the flying bridge of the Collett, 67-68. Collett bridge from fwd fuel station while alongside, 67-68. 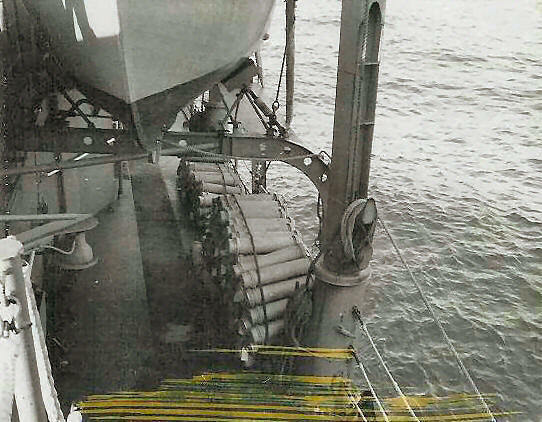 Collett highlining with carrier, 67-68. Collett after fuel station, 67-68. 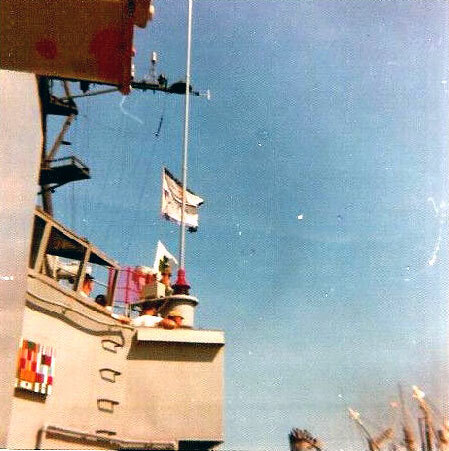 Collett MWB at the ready on Yankee Station, 67-68. 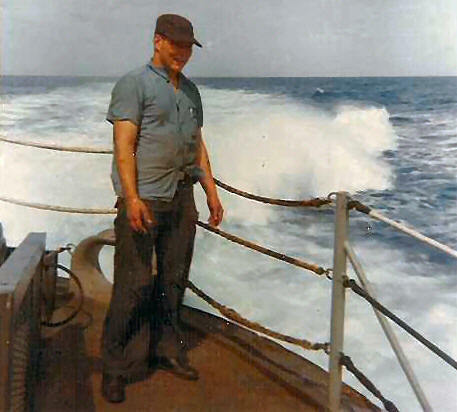 Collett deck seaman, 1967; I think his nickname was "Tug" from Boston. 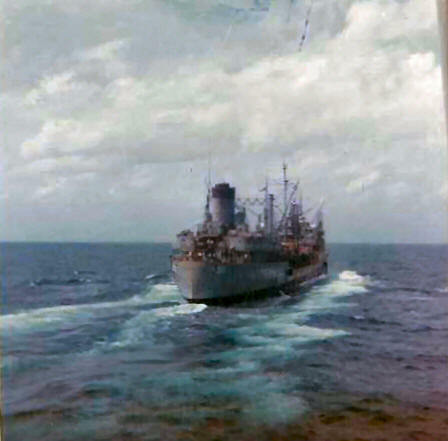 Collett going alongside Chemung AO-30, 1967. Collett going for more bullets from AE-19, 1967. 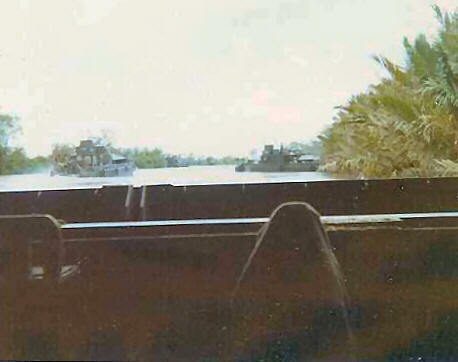 Operating with 9th Inf Div in Mekong Delta, ATC-131-12. 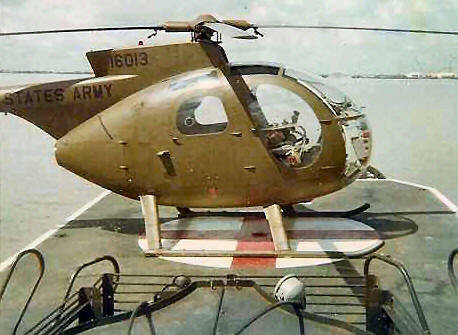 A scout chopper on deck of ATC-131-12, Mekong Delta, 1968. 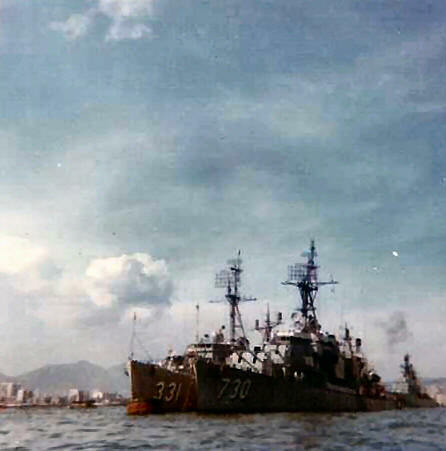 After leaving MRF around Aug 68 I went to NSA Danang & Cua Viet. 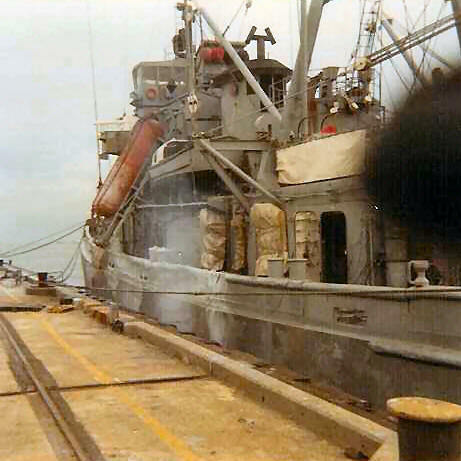 At Cua Viet (hell of a place for a fleet sailor) I ran a couple of LCM mine sweeps and a Mike 8 cargo boat up the river to the Marine Base at Dong Ha and sometimes Quang Tri. Not a nice river to run. 1968. 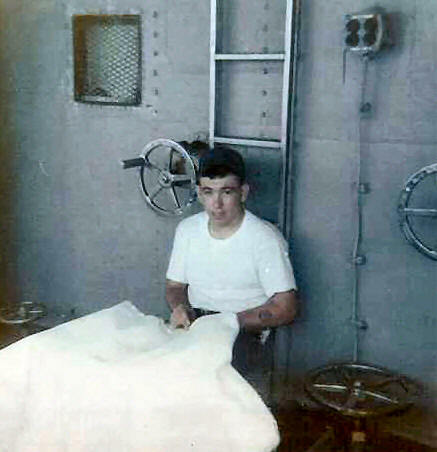 Next I went to NSA's Small Craft Repair Facility Diving Barge, Dec 1968. 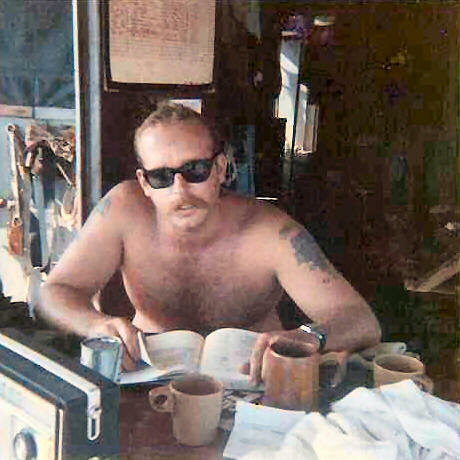 Yours truly on the front porch of the diving barge in Danang Harbor (early 69). We did our local repair diving here, and I was the craftmaster/diver on the LCM8-912 salvage boat that worked all of I Corps rivers and off shore POL lines. We also had a 50 foot utility boat rigger for surface supplied diving and a Boston whaler for diving all around the Danang Harbor. 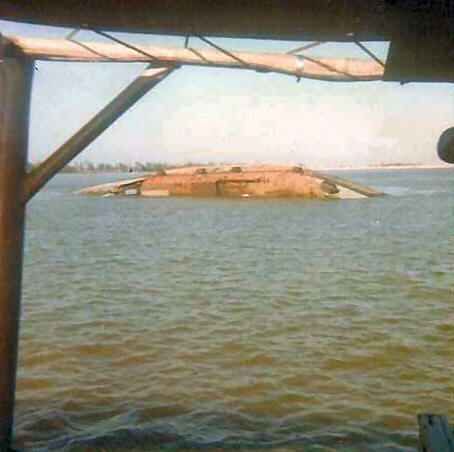 LCM 6 sunk in Danang Harbor 1969. 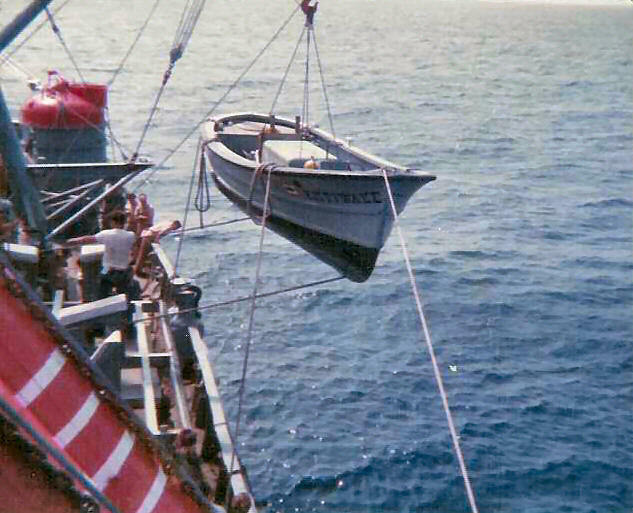 Here we are diving off of my salvage boat to hook up lifting slings for YD to lift the boat, 1969. 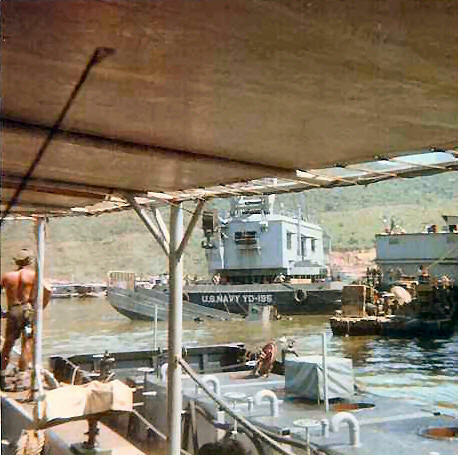 Bridge Ramp, Danang , early 1969. This was the scene for 200 yards surrounding the area where the YFU-78 and the LCU-1500 were blown up while loaded with ammo. 1969. 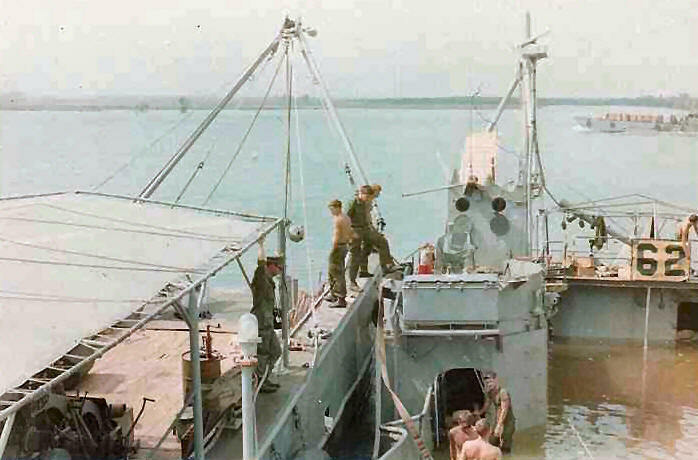 Picking up the LCM 6 in Danang after divers attached the slings, 1969. 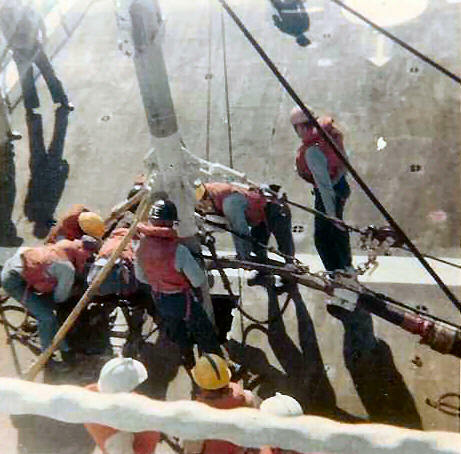 Lifting the sunken LCM 6 and putting it on the wall for repairs, 1969. Bridge ramp after the explosions of the 78 and 1500, early 1969. 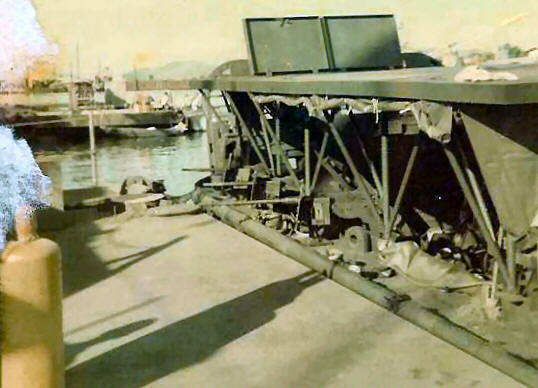 The pieces of the 78 and 1500 after they were blown up at Bridge Ramp in Danang...the stern of the 1500 is under the water by the stern of the 78 that can be seen out of the water. 1969. 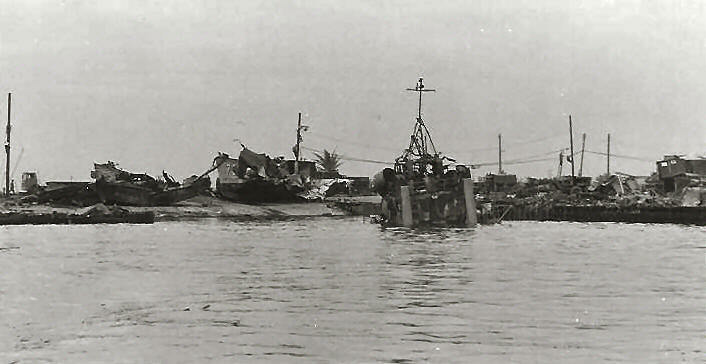 PBR salvage on the Cua Viet River, 1969. 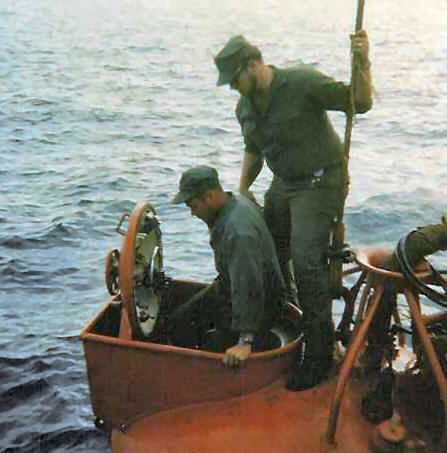 Here we are picking up a PBR sunk just west of Cua Viet in 1969 using the LCM-912 salvage boat..we spent a lot of time working up here close to the DMZ..a lot of boats were lost up here during 1968 and 1969. 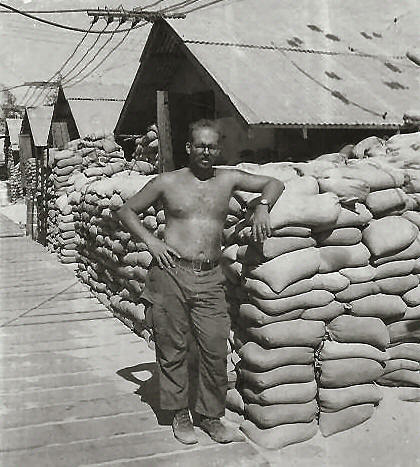 Working another PBR on the Cua Viet river, 1969. A good shot looking down the well deck of the LCM 912 while working a salvage job on the Cua Viet River. 1969. 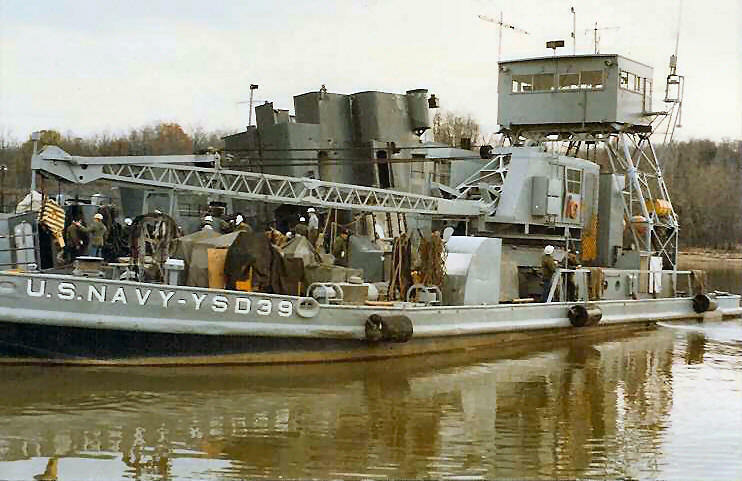 LCM-912 alongside the YFU-62 on Cua Viet River, 1969. 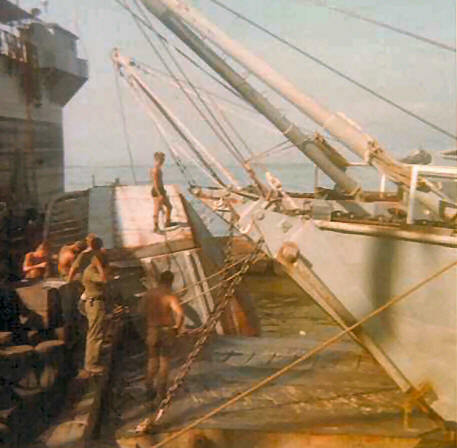 Divers, working off LCM-912, doing survey of YFU-62 after it was sunk by a mine in the Cua Viet River in 1969...she was so badly damaged we had to leave her there. 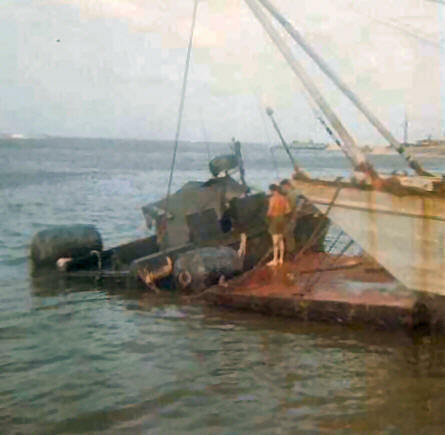 YFU-62 sunk in Cua Viet River, 1969. This is where she stayed for now..just a reminder that this is not a nice river to run. 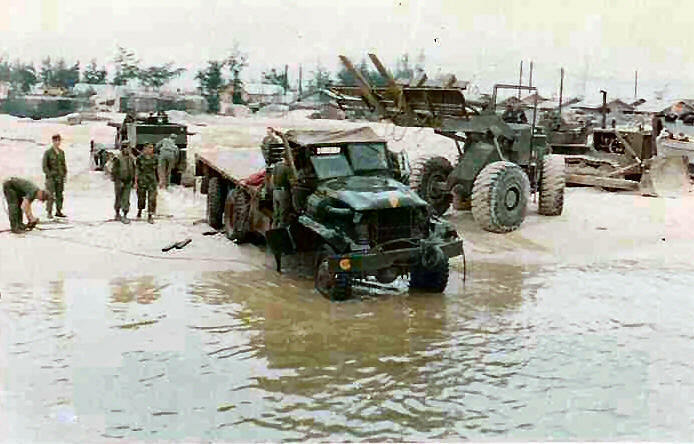 Marine truck salvaged from Cua Viet river, 1969. 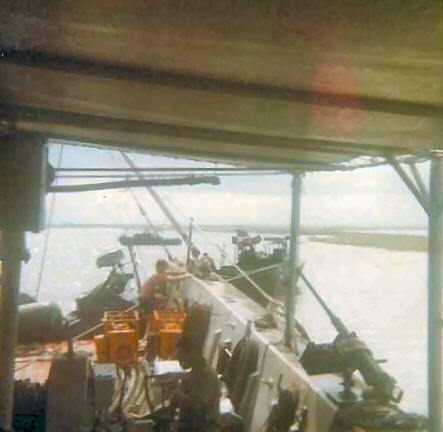 Marine truck that had been going up the Cua Viet River in an LCM-8 when it hit a mine and was blown out of the boat..divers hooked on to it and we lifted it out of the river and carried ti back to Cua Viet hanging on the A-frame across the front of the boat. 1969. 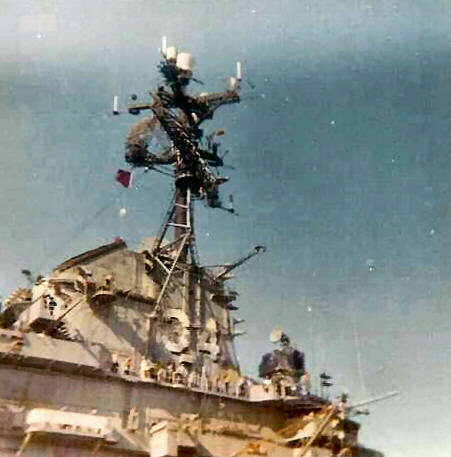 Yog-76 lying on her side after sappers got her in Cua Viet in late 1969. 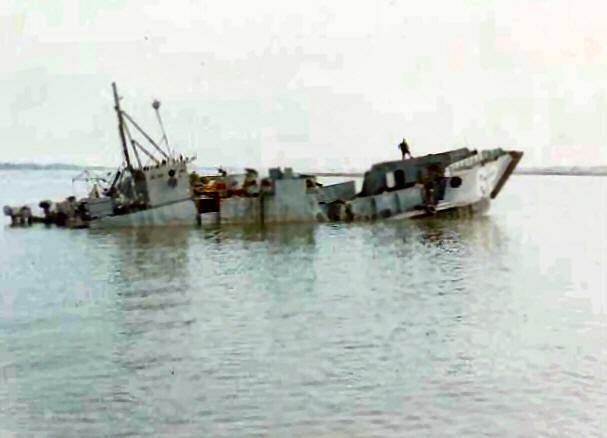 The YOG-76 was sunk by sapper swimmers in December 1969..This is the last salvage job I worked on before I left country in late December 1969..She was later raided and towed back to Danang in early 1970. USS Skylark ASR-20, Mixed gas diving. 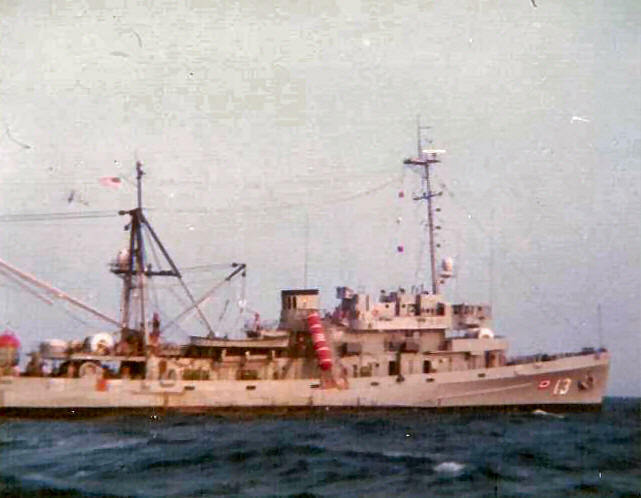 After Nam I went to First Class Diving School at the Naval School, Diving and Salvage in Washington, DC then to the USS Skylark ASR-20 out of New London, CT as a BM2(DV) 1971-1973. Here I am (foreground) getting suited up along with BMV(DV) Ernie Caultenack for a mixed gas qual dive. 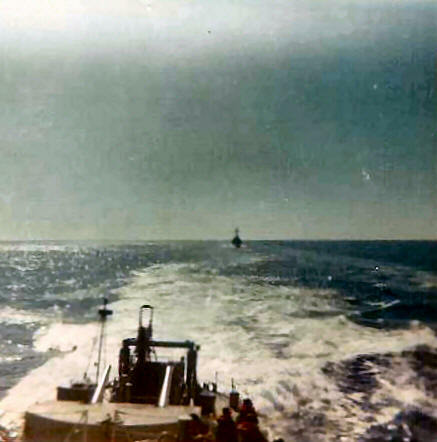 USS Skylard Sub Rescue operations for quals. 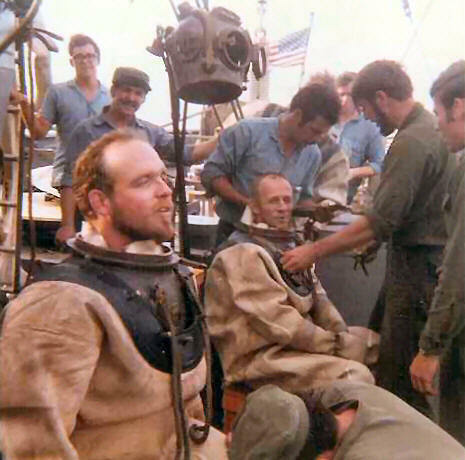 Here I am assisting personnel into the Skylark Submarine Rescue Chamber during qualification runs 75-76..I was also a qualified bell operator. USS Skylark ASR-20 in Boston for picking up a tow, winter 71-72. Here the Skylark is in Boston picking up the first of two submarines to be towed to New London during the winter. We spent a lot of time breaking ice off of her. Going around Cape Cod with one we hit a pretty rought storm and we made a half a mile backwards during one 12 hour period. USS Kittiwake ASR-13, laying a 4-point moor 75-76. After Skylark I went to the Howard W. Gilmore AS-16 in La Madalena, Sardinia of which I haven't found my pictures yet. Then I went to USS Kittiwake ASR-13.. Here she is laying a 4-point moor for bell ops sometime in 75-76. 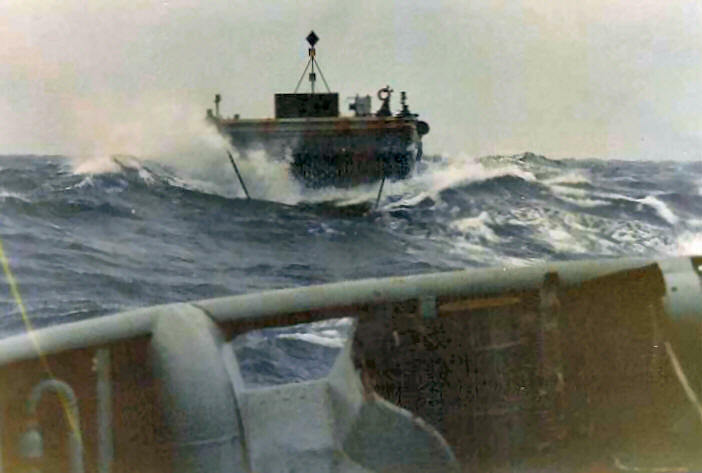 USS Kittiwake ASR-13 launching a boat. 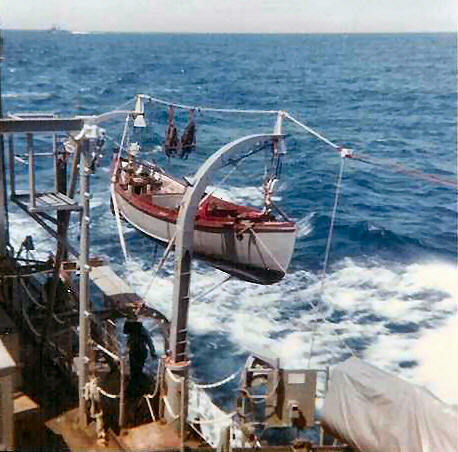 Here we are launching a 35' hawser handling boat in preps for laying a moor for diving and bell ops, 75-76. YSD-39 at salvage project of Naval School, Diving and Salvage. 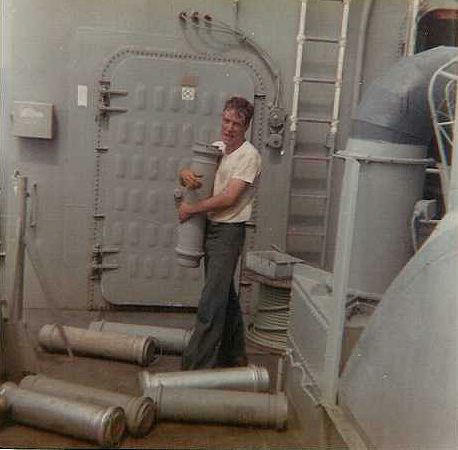 After Kittiwake, I went back to Washington, DC as an instructor at the Naval School, Diving and Salvage. While teaching salvage, I was also Craftmaster of YSD-39 used as a salvage platform when students had to raise the wreck during their 2 weeks down river for salvage training. 76-78. 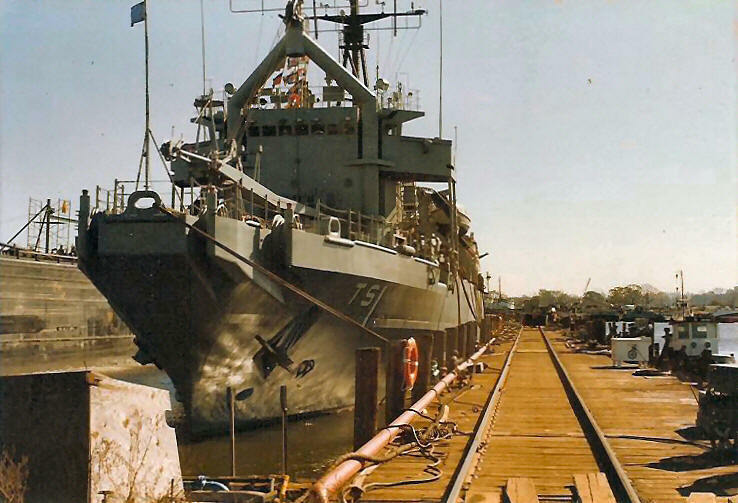 After my tour at diving school I went to the USS Edenton ATS-1 as a BMC(DV).. Made a Med cruise on here..did some towing, mine ex's, joint diving and bell ops with the Italians. 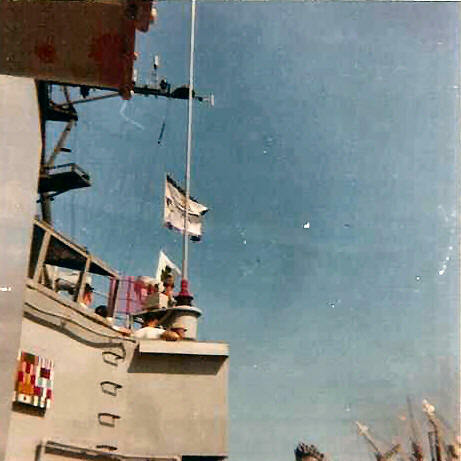 I left in April 79 when I made LDO and went to the USS L. Y. Spear AS-36. 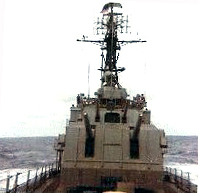 USS L. Y. Spear AS-36, 79-81. 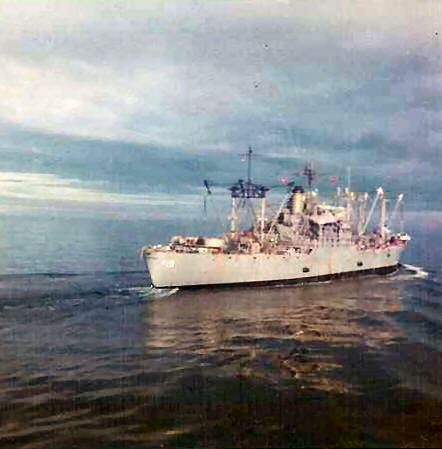 USS L. Y. Spear made an Indian Ocean run to Diego Garcia, BIOT in 1980 with only 30 days warning. That was quite a trip. We had subs on one side and surface ships on the other. Here I am getting my jg bars from Capt. John Kinnert. 1981. Trans Atlantic tow of barge for Army us USS Opportune ARS-41. 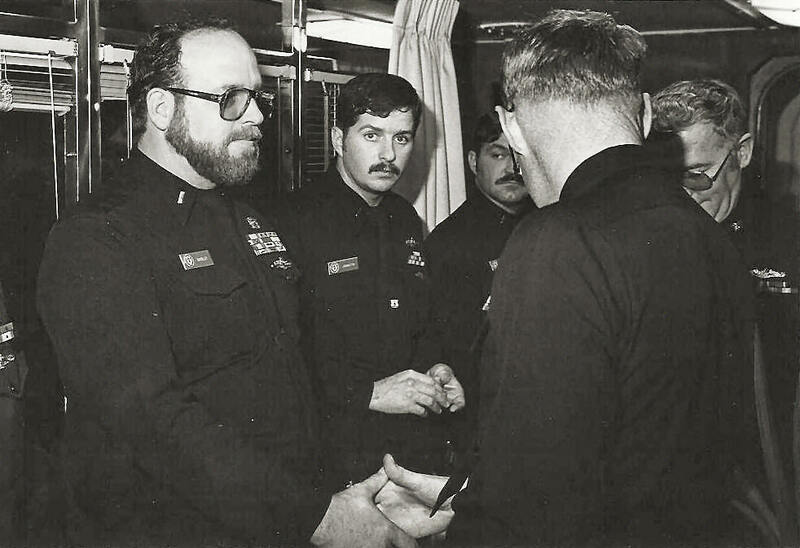 Following my tour as First Lieutenant and Diving Officer on Spear, I went to the USS Opportune ARS-41 as Weapons, Deck and Salvage Officer. 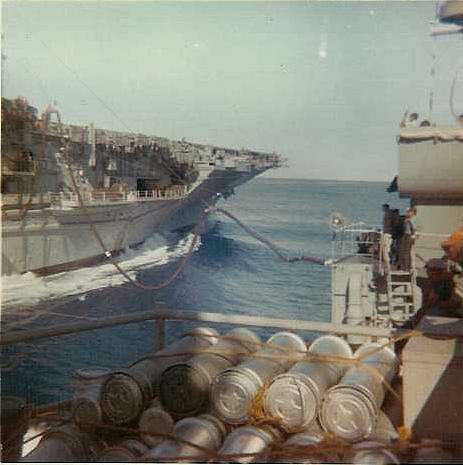 We made a Trans Atlantic tow on our way to the Med, did some mine ex's salvage work in the Med and Red Sea and had quite a trip. 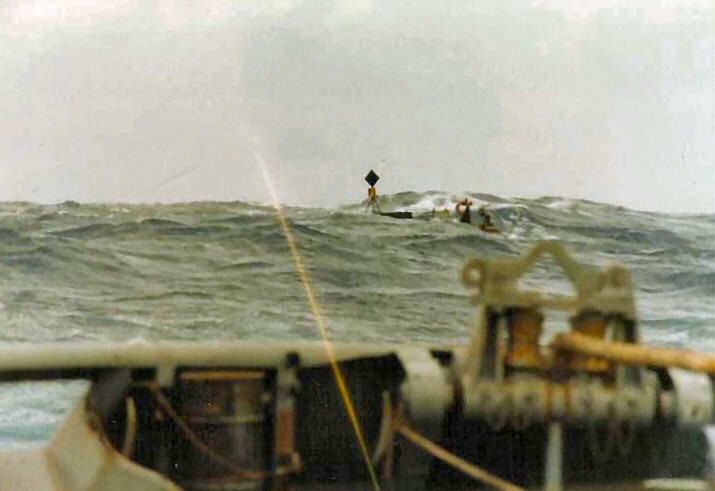 Here is one shot of our Atlantic tow in some good seas. 1981. 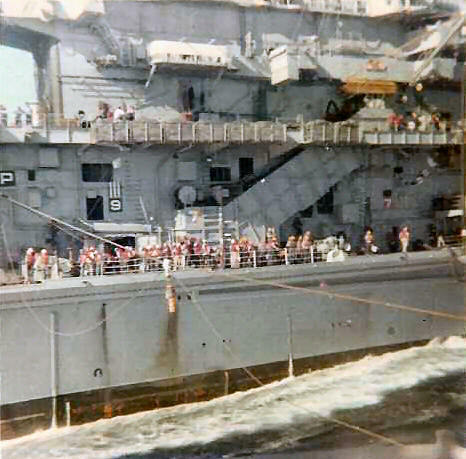 USS Opportune ARS-41 Trans Atlantic tow, 1981. Here's another shot of the tow to show you the seas we were towing in..some days we were only making 2 knots good.